Designing and building special-purpose machines for assembly applications can be a daunting prospect, given the ever-increasing demands for speed, reliability and output. According to Weiss, the risk of failing to achieve one or more of these objectives is significantly increased when conventional pneumatic devices are used; pneumatically operated assembly machines require complex control systems and an array of sensors, which, in turn, are susceptible to failure. Weiss has therefore developed the Pick-O-Mat, a cam-operated assembly system that is designed and built upon the Weiss philosophy of providing high performance and cost effective systems for assembly tasks. The Pick-O-Mat system uses a single central drive to operate up to 24 pick-and-place modules at speeds of up to 75 cycles per minute, providing a robust and reliable platform for automated assembly. 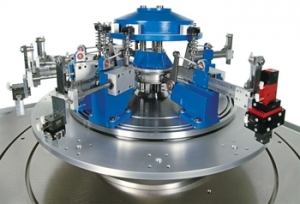 The rotary indexing table is linked electronically to the central drive, providing smooth and synchronous operation, with one 360-degree rotation of the barrel cam on the central drive unit generating a complete cycle (four vertical strokes + two horizontal strokes) for the pick-and-place units. The impressive performance characteristics of the system are further enhanced by the 40mm vertical and 120mm horizontal strokes and a positional repeatability of +/-0.03mm. These attributes make the Pick-O-Mat concept adaptable to a wide range of automated assembly applications. The system can also be configured to enable different strokes on individual pick-and-place modules by modifying the lever mechanisms. Two models of Pick-O-Mat are available: PM1100 with a 1050mm diameter dial plate and the PM1500 with a 1500mm dial plate. The latter model can also accommodate up to 36 index positions. The design simplicity of the Pick-O-Mat, combined with the repeatability and reliability of all Weiss products, mean that machine builders and end users alike can expect high up times and efficiencies. However, the Pick-O-Mat concept does not stop at the assembly mechanism; Weiss also offers a wide range of complementary items, allowing machine builders or end users to specify as much or as little automation as they wish. For example, an essential part of any automation system, if speed and repeatability are to be maintained, is a robust machine base. Weiss offers standard options on circular or square steel fabricated machine bases (which can also be manufactured to the customer's drawing), providing a sound mounting platform for the Pick-O-Mat. Additional assembly modules such as lift units, press units and the Weiss HP140 programmable pick-and-place unit can be specified and mechanically integrated by Weiss at the production stage, thereby saving valuable machine development time for the machine builder or end user. The performance and flexibility of the Pick-O-Mat system enables it to be used in a number of different industrial applications: assembly of electrical sockets, domestic plumbing components, regulator valves and packing DVD's into cases, to name but a few. Weiss manufactures a complete range of rotary and linear indexing systems, plus fully programmable pick-and-place units, which can be applied to a wide range of automation applications.